Following its mission – “caring about people, caring about environment, working towards a sustainable world” – Nektarina Non Profit started the initiative to introduce education for sustainable development in schools’ curriculum in the countries of Central, Eastern and South East Europe, Russia and Central Asia (for a full list of countries, please visit About us page). The notion of 'sustainability' emerged in the 1980s and has now become one of the key concepts for exploring the impact of human activity on the planet. Put at its most simple any human activity is sustainable if it can continue fairly indefinitely without causing harm to either people or planet. Alternatively, any human activity that results in on-going harm to either people or planet is the opposite – unsustainable. It has now become clear that many of our practices today come in the latter category. It was at the Earth Summit in 1992 that this vital (and contested) concept became enshrined in national and international policy and debate. This occurred because it was then recognized that human activity was increasingly threatening the biosphere – that narrow zone of earth, air, water – on which all life (plants, creatures, humans) depends. It also occurred because it was recognized that issues of development, i.e. global wealth and poverty, were increasingly threatening people's life chances in both poor and rich countries. At the Earth Summit it was also recognized that education, at all levels, had a crucial role to play in helping citizens understand and act on issues relating to the welfare of people and planet. The term 'education for sustainable development' (ESD) and 'education for sustainability' (EFS) then began to become part of educational vocabulary. There were, of course, a good number of educators who were already showing an interest in issues of sustainability/unsustainability, particularly amongst those working in environmental education, global education and futures education. Whilst the education for sustainability can be seen as a cross-curricular theme to which all subjects could contribute, it received a significant boost when the focus was widened to the notion of 'sustainable schools'. At one step this moved issues of sustainability from an optional element in the curriculum to a matter of whole-school policy affecting every aspect of school life. 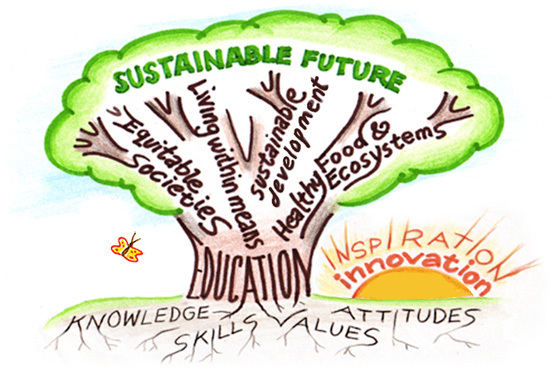 The educational strategy on Sustainable Schools should encompass the following focus areas: i) food and drink; ii) energy and water; iii) travel and traffic; iv) purchasing and waste; v) buildings and grounds; vi) inclusion and participation; vii) local well being; viii) global citizenship. Sustainable schools have a major part to play in the face of global issues such as climate change, ethical consumerism, energy use and peak oil. All such issues have an impact on the school and local community. Having in mind that today’s pupils and students will be tomorrow’s decision makers, helping them engage with sustainability issues in a critical and creative manner results in greater 'ownership' of the issues and a willingness to engage in active citizenship now and for the future.